I’ve been looking forward to sharing this recipe! My husband and I first tried it a couple of years ago, and it has been a staple in our house ever since. I actually got the idea from an old neighbor friend who posted a similar recipe on her blog. 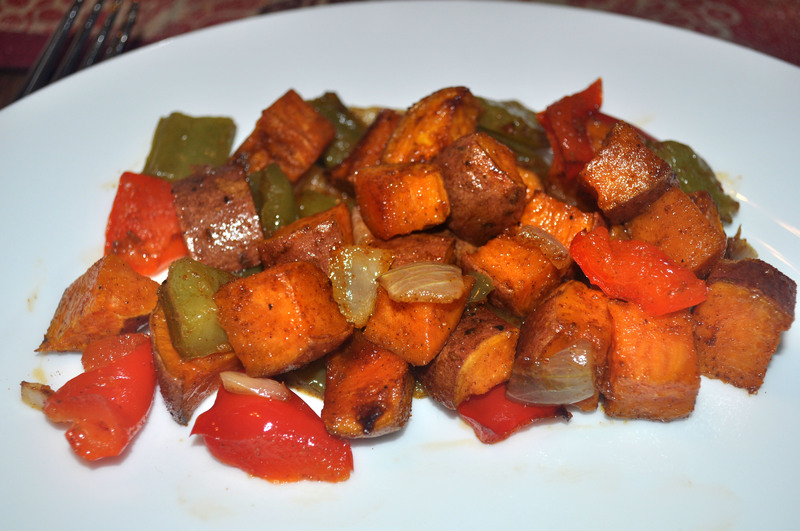 The sweetness of the sweet potatoes and the spiciness of the Cajun seasoning are a delicious contrast and flavor combination, and bell peppers and onions are perfect additions to the mix. This works well as a side, or you could add protein, like ground turkey or eggs, to make it a main dish for any meal of the day. Any way you have it, you can’t really go wrong. In the past, my husband didn’t like sweet potatoes, but this was his gateway dish. He loves this stuff and chooses to have it frequently, and now he likes sweet potatoes in any form. First, you’ll need to preheat the oven to 420. 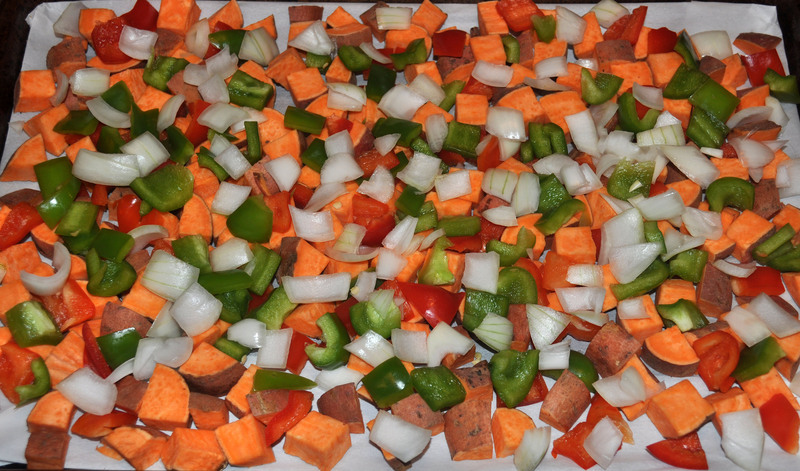 Then cut the sweet potatoes into cubes, and chop the bell peppers and onion. 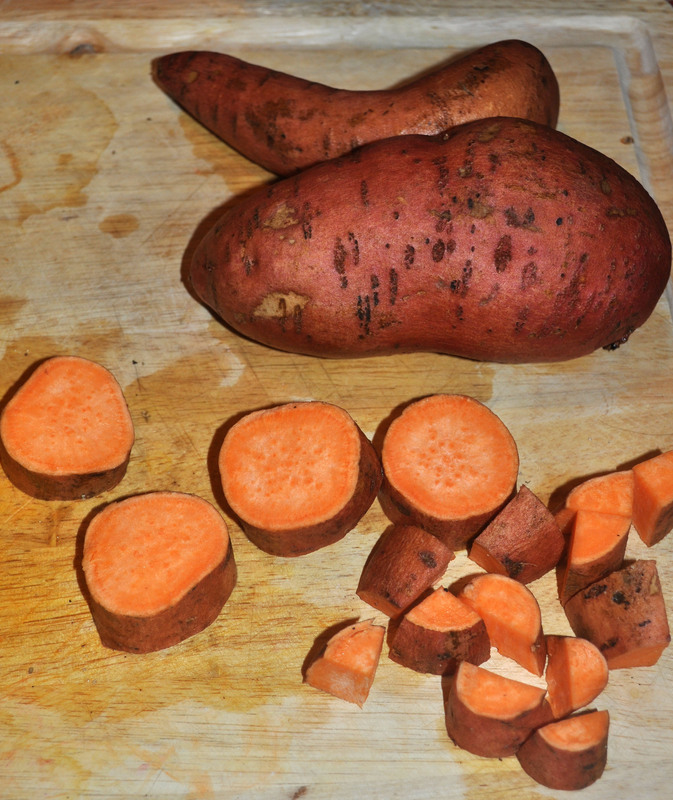 To cut the sweet potatoes, I cut thick, round slices and then quarter those. Bake at 420 for 20-30 minutes. If you would like them to be a bit crispy, turn the broiler on for a few minutes after baking (without parchment paper, of course). Once soft all the way through, remove from oven. Adjust seasoning to taste (I like to add lots of Cajun) and add salt to taste if needed. As I mentioned, you could also add protein to this, such as ground turkey, ground beef, sausage, or eggs. Another way to try it is with different seasoning, such as cinnamon. It may sound strange, but it’s so good, especially with ground turkey or beef seasoned the same way! Try it as is, change it up, or both! Let me know what you try and how you like it best! Preheat oven to 420. 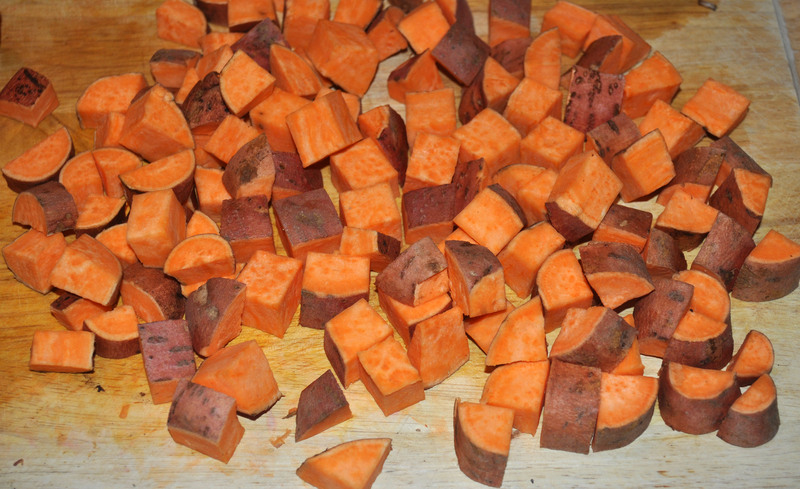 Cut sweet potatoes into cubes. Chop bell peppers and onion. Spread it all out in one layer on greased baking sheet. Coat with oil or ghee. Season with Cajun seasoning. Bake at 420 for 20-30 minutes. If you would like them to be a bit crispy, turn the broiler on for a few minutes after baking. Once soft all the way through, remove from oven. Adjust seasoning to taste and add salt to taste if needed.